Rag quilts are fun to make. They're soft, they're cuddly and they are easy to assemble. All of the pictures of rag quilts in this photo gallery were made by members of the online quilting community. From Log Cabin Lady: This rag quilt was made for one of our granddaughters, Kelsey, for her high school graduation. She loves cats and dogs and I knew she would be delighted to have them on a quilt for her dorm room. It is a twin size rag quilt. Try the Indian Hatchet Rag quilt pattern if you'd like to make a rag quilt with triangles. From LadyK: I made this quilt for the Cancer Center where I am a survivor of breast cancer. The quilt was given away in a raffle, on Survivors' Day. The quilt is made from a combination of fleece, flannel, and lace. Several squares are embroidered with either a single word or the saying Walk in Faith Not in Fear. This was truly a quilt made from the heart. From Denby: "This quilt has a free motion rose stitched in the solid pink squares. From Lizzythompson: The inspiration for this quilt came from Janet's newsletter. When I saw the double four patch pattern, it hit me why I was saving all those fat quarters of Island Batik fabric. I belong to a Fat Quarter Club and every month for the last two years I have been getting 12 fat quarters of Island Batiks in the mail. I don't have a long arm quilting machine -- just a straight stitch Singer Precision, so I knew I would never be able to quilt a large quilt (7- 13" squares by 9 rows) in one piece. I decided to make a rag quilt and quilt each block individually before sewing them together. The quilting is very simple, just stitch in the ditch around the bigger squares. I decided to tie the intersections of the four patch blocks for a little more interest. 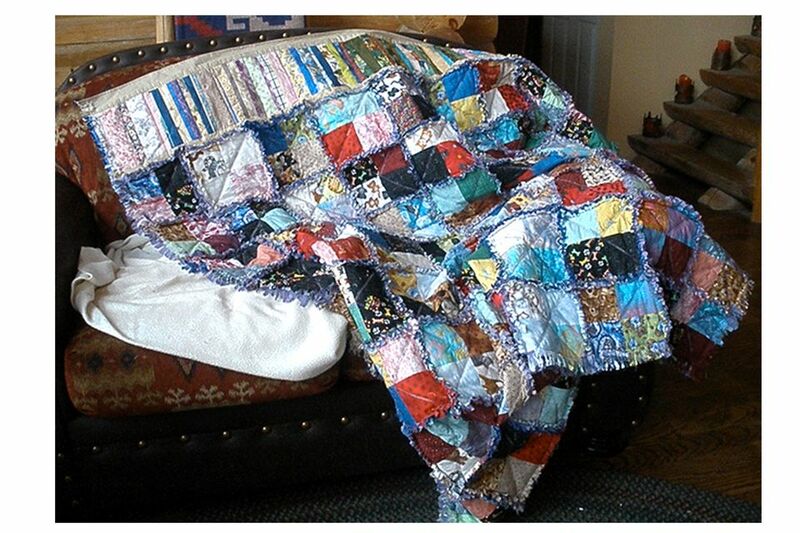 From Denby: "This rag quilt has free motion quilting within each block, done before assembly. It is a mixture of larger blocks and narrow strips." From Cindy: "This is a lap quilt that I quickly put together from a pattern on this site for the daughter of a friend who has Cystic Fibrosis and was in for yet another lengthy hospital stay on IV antibiotics. The rag edges give her something to "worry" when she needs a distraction from the needles and other unwelcome intrusions. It's done in her favorite colors for fall." From Faith: I saw a rag quilt similar to this online and it looked easy enough for a beginner like me to make. It is a perfect size for lounging on the couch or for a cool night outdoors. The quilt measures 47" wide by 64" long. From Jen: My husband loves NASCAR, so I made him this rag quilt for his thirtieth birthday. From RoofingPrincess: Each of the very light squares in this rag quilt is a picture of one of my sister Jodee's dogs. The photos are printed onto the fabric. My sister runs a senior dog sanctuary at her hobby farm in Wisconsin. She takes in dogs who have been brought to the local Humane Society because they are old and sick, and their owners don't want to care for them anymore. Because of their condition, they're not candidates for normal adoption, so the society calls Jodee. I asked Jodee if she'd like a rag quilt with all of her dogs on it. We collaborated online, she picked out potential fabrics, and then I went to my local store and chose the actual fabrics from her proposals based on how they actually looked together. From Helen: I made this quilt for my friend, Becky, who lives in Florida. She is a horse and cat lover and also loves homemade things, so this quilt was perfect for her birthday. I used 100 percent cotton for the rag quilt's top and backing and replaced the quilt batting with another cotton fabric. A friend made a tassel for the quilt out of horse mane hair. From Julie: I made this rag quilt for a friend's new baby girl. I have made several rag quilts as baby shower gifts, but this is the first one that I have made using a somewhat detailed pattern. From Juli: My son loves the Minnesota Vikings, so for my first quilt I made him this Vikings rag quilt. It was easy, and he loves it. I sewed four patch blocks next to large squares on the front of the quilt, and all large squares on the back. From Renea: I saw your Rags 'n Hearts rag quilt pattern and decided to make one for my 81-year-old mother, for Christmas. My daughter has an embroidery machine and helped me make the quilt. My mother loved it. I made matching pillows for my mother's throw sized quilt. From Denby: "The squares in this quilt are all stitched with a star design. I use 100-percent cotton batting in all my rag quilts. I also put a binding on this quilt. The quilt backing is made from plaid flannel shirt fabrics in patriotic colors." From Denby: "This quilt covers the top of a queen size bed. It was free motion stitched in a scroll design on each block before assembly. The blocks range in size from 7.5" to 10.75" and are mixed with narrow 4.25" strips." From GranmaGladys: I made this rag quilt for my grandson, Ryland. It's flannel on both sides and measures 50" x 60". I really enjoyed sewing it, although it took me a long time to snip all the seam allowances after it was finished. I pre-washed the fabrics to minimize shrinkage. From Ladyk 1943: I made this rag quilt for my grandson who is stationed in Iraq and flies the Shadow 200 unmanned aircraft for the US Army. Since it gets so cold at night in the desert, he really appreciated the quilt. The size is 4 ft by 6 1/2 ft to fit his army cot. I put a patch in one square for his company and two squares display the call signs that he uses when he launches the plane. From larnpamd: This is a rag quilt I made for our son and daughter-in-law. Our son is in the Army and I loved the large squares that had the highway signs on them to signify his moving his family around the country when duty calls. From Christine: I helped my step-mother make this wonderfully cozy quilt. I cross-hatched the layers and she laid out the squares and sewed them together. The photo shows the denim side before it was washed. Pattern for a similar quilt: Four-Patch Rag Quilt with setting squares. From Vlisajo: This is the first rag quilt I've ever made and it was a lot of fun. I didn't have enough of the reindeer fabric, so I improvised with other colors. Jordyn loves it. From Jackie: I found this series of flannels at our local Wal-mart when I was pregnant with my second child. Wanting to do something a little different, I created a rag quilt using 4" blocks instead of the standard 9" blocks. From Robicole: I made this rag quilt from shirts that were given to me by a friend. You can make this easy rag quilt in just a day or two by following my simple rag quilt pattern.